Gait analysis is one of our great diagnostic tools, allowing us to see any bio-mechanical issues that may be linked to reoccurring injuries or causing painful symptoms. With the aid of the foot scan system along with video recordings we can pin point any misalignments in your movement. A simple correction of posture can relieve a lot of painful symptoms. Gait analysis is the systematic study of walking and running to analyse biomechanical dysfunctions of the body. It is used for diagnosis of injury and the planning of treatment for patients who suffer from conditions concerning their gait, as well as being useful in sport for increasing performance. Our system offers analysis of walking and or running over the RS footscan mat. 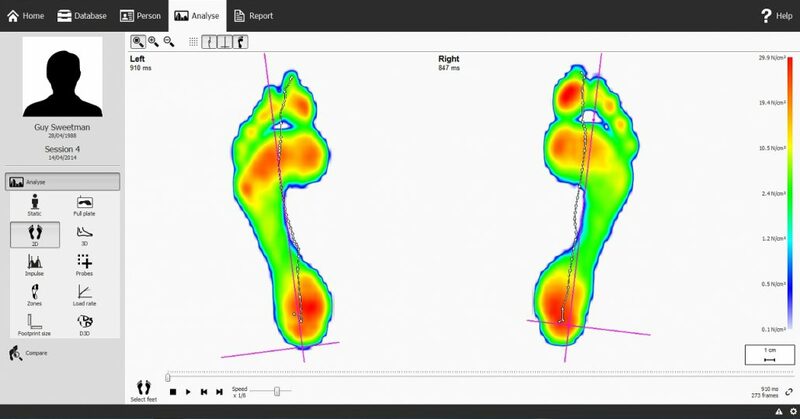 With over 4000 sensors embedded into it we gain in depth analysis of your foot positions, pressure and force distributed during the motion, in both 2D and 3D. The advanced software allows automatic division of the foot into specific regions. This allows force and pressure distribution within these areas to be analysed and associated with certain foot mechanics and functions which may affect the kinetic chain of your gait. Using this in depth technique, we can not only resolve your injury, but also prevent it from reoccurring. Injuries that would benefit greatly from our gait analysis would be ITB syndrome, plantar fasciitis and Achilles tendonitis.